A eukaryotic cell is divided into different organelles such as a chloroplast, mitochondrion, endoplasmic reticulum and Golgi apparatus (figure 1 left panel). These organelles typically comprise membrane-enclosed compartments that each contain specific metabolic enzymes and other proteins. This cellular compartmentalization enables separation of distinct biochemical reactions, thereby preventing “chemical chaos”. The proteinaceous residents of organelles are, however, initially synthesized by cytosolic ribosomes and are subsequently directed towards their appropriate cellular location. The logistical feat of cellular protein transport is in general accomplished by equipping proteins that function in organelles or the cytoplasmic membrane with a hydrophobic, organelle-specific export signal (1). Many exported proteins are, for example, synthesized with an N-terminal signal sequence that is responsible for targeting its cargo to the right cellular compartment and is proteolytically removed after export. Additionally, the first transmembrane domain (TMD) of a membrane protein is functionally similar to a signal sequence. These targeting signals are recognized by specific receptor proteins at the surface of the target organelle, thereby ensuring the specificity of the targeting signal (1). The vast majority of proteins that function in the ER, Golgi, lysosomes or cell surface are exported through the so-called Sec pathway (2). This can occur either posttranslationally - after completion of protein synthesis, or cotranslationally - during translation. 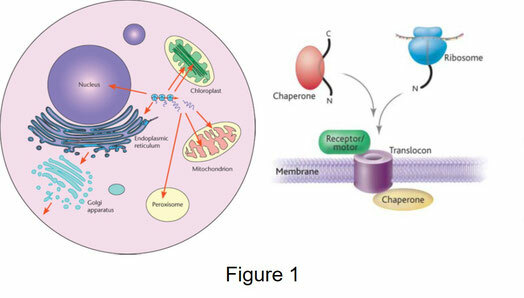 In posttranslational translocation, proteins are kept in an unfolded (translocation competent) state through association with chaperones and are subsequently targeted to the membrane-embedded translocation site, or translocon (figure 1 right panel adopted from 1). During cotranslational targeting, protein synthesis is arrested following emergence of the export signal and the ribosome-nascent chain complex is delivered at the translocon after which translation continues (figure 1 right panel). Most eukaryotic secretory proteins are delivered cotranslationally at the translocon after which they transferred to their final destination by vesicle mediated transported (3). The translocon functions as a protein conducting channel (PCC) and is located in the endoplasmic membrane of eukaryotes or the cytoplasmic membrane of bacteria and archaea. The PCC represents an evolutionarily conserved membrane protein complex made up of three subunits, namely: Sec61α, Sec61β and Sec61γ in mammals and SecY, SecE and SecG in bacteria (2). Recently, cryo-EM reconstructions of the mammalian Sec61 complex in different functional states were presented (5,6), offering profound insight into the molecular details of protein translocation and membrane protein insertion. Here, I will discuss these novel structural data and the current understanding of how the Sec61 operates. In eukaryotes, most proteins are exported via the secretory pathway to either the ER, Golgi, lysosomes or cell surface. This journey typically starts with cotranslational targeting to the Sec61 channel located in the endoplasmic membrane. Consequently, the part of the ER that is associated with translocating ribosomes is known as rough ER. In bacteria, however, cotranslational targeting is the main mode of transport for most cytoplasmic membrane proteins, while proteins that function at other places in the cell envelope are typically transported in a posttranslational fashion (2). The basic biochemical steps of cotranslational targeting in eukaryotes were elucidated with in vitro transport assays in which the translocation reaction is reconstituted using a cell free translation system, such as a wheat germ cytosolic extract, in combination with microsomes (figure 2 adapted from 7). Translocation of the in vitro produced substrate protein is only observed in the presence of microsomes as evidenced by removal of the signal sequence. This because everything occurs cotranslationally. 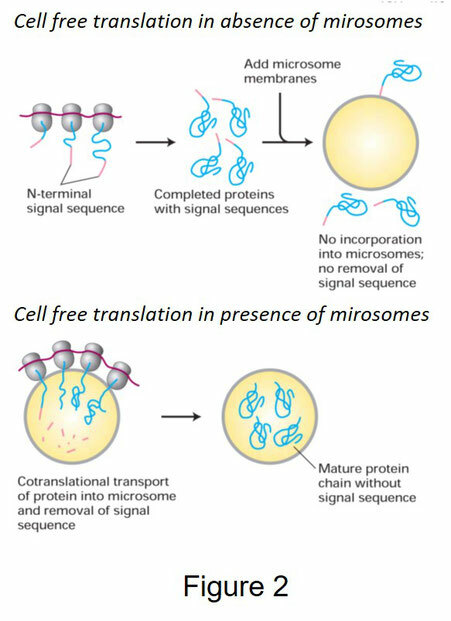 If microsomes are added after translation, translocation will not occur. The cotranslational targeting cycle is initiated (figure 3 adapted from 1) in the cytosol when a signal sequence or TMD is recognized by the universally conserved signal recognition particle (SRP) as soon as it emerges from the ribosomal exit tunnel (3). The ribosome-nascent chain complex is targeted to the SRP receptor located at the endoplasmic membrane. 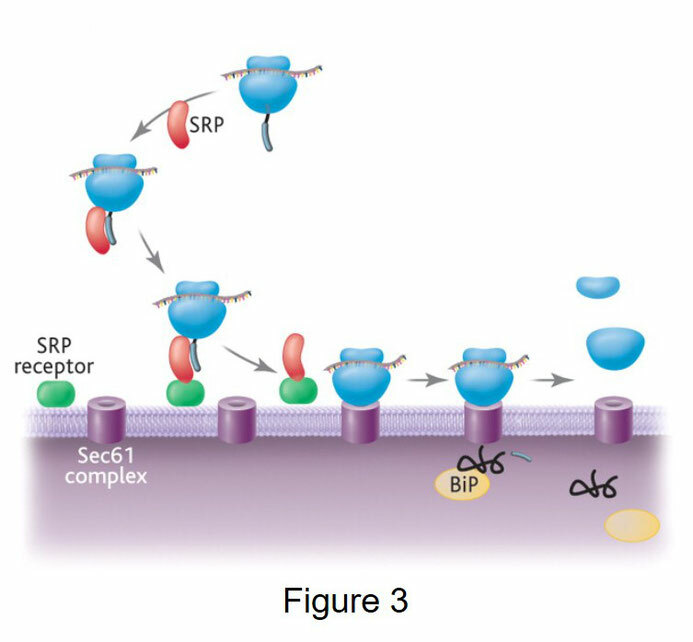 Following binding of GTP to SRP and its receptor, the ribosome-nascent chain complex is transferred to the membrane-embedded Sec61 complex after which translation resumes and the polypeptide chain is translocated. Subsequently GTP hydrolysis, results in disassembly of the SRP-receptor complex (3). Within the lumen of the ER, the nascent polypeptide interacts with different chaperones such as the ATPase BiP to attain its proper folding. The driving force for protein export through the Sec61 channel is in the case of cotranslational translocation provided by the ribosome, thus the energy derived from chain elongation at the ribosome is probably sufficient to push the polypeptide through the Sec61 channel in one direction (2). In contrast, posttranslational translocation is powered by ATP hydrolysis catalyzed by BiP (2). With ongoing translation, the signal sequence of the growing polypeptide chain is removed by leader peptidase within the lumen of the ER. This is a protease embedded in the endoplasmic membrane that is associated with the Sec61 complex (1). It is now well established that the Sec translocon is universally conserved and plays a crucial role in protein translocation throughout all organisms. To obtain a comprehensive understanding of the Sec machinery it is important to consider the available genetic, biochemical and structural data derived from the eukaryotic, prokaryotic and archaeal translocon. The Sec system is a heterotrimeric complex made up of Sec61α, Sec61β, Sec61γ in eukaryotes and SecY, SecE and SecG in bacteria. All subunits of the Sec complex are integral membrane proteins and of these Sec61α/SecY is the largest subunit and spans the membrane ten times, while Sec61β/SecG and Sec61γ/SecE are smaller and the span the membrane only one time (2). Moreover, Sec61α/SecY and Sec61γ/SecE are essential for cell viability in yeast and bacteria. The genes encoding Sec61α, SecY and SecE were initially identified by using conditional mutants of yeast and Escherichia coli (8,9). Subsequently, these proteins were purified and their role in protein transport was confirmed by reconstituting Sec-dependent translocation in vitro. By this approach it was shown that liposomes containing purified SecY, SecE and SecG are able to import a model secretory protein in the presence of SecA (1). Likewise, if was found that the presence of purified Sec61α, Sec61β, Sec61γ and SRP receptor into liposomes is sufficient to facilitate import of eukaryotic substrate proteins (10). Despite the wealth of genetic and biochemical information on the bacterial and eukaryotic Sec machinery, a mechanistic understanding of how the translocon handles substrate proteins during translocation and membrane insertion remained poorly understood due to a lack of structural data. However, in 2004 the crystal structure of the SecY complex from the thermophilic archaeon Methanocaldococcus jannaschii was presented at 3.2 Å (11), offering the first insight into how the Sec apparatus operates. The structure of the M. jannaschii SecY complex is shown in figure 4 and based on the sequence conservation of the subunits of the Sec complex, it can be expected that its structure is also evolutionarily conserved and is therefore also representative for all species. The structure of the M. jannaschii SecY complex contains one copy of the translocation channel that is made up of three individual subunits. The α-subunit comprises 10 TMDs, while the β and γ-subunit only contain one TMD. The α-subunit is divided into N- and C-terminal halves with TMD 1-5 (shown in red) and 6-10 (shown in grey). The α-subunit is open on one side (the front) that probably functions as a lateral gate (between TMD 2 and 7), enabling the channel to open toward the lipid bilayer. The α-subunit is, moreover, surrounded by the other smaller subunits. The top view from the cytoplasm (upper left panel) shows that the β-subunit (in green) has limited contacts with the α-subunit, while one helix of the γ-subunit (in yellow) stabilizes the α-subunit through numerous interactions. This explains why the γ-subunit is essential for the functionality of the Sec complex unlike the β-subunit. The top view also reveals a central pore between the halves of the α-subunit that is blocked by short helix, termed the plug (in orange). This domain probably maintains the permeability barrier when the channel is not in use. The observation that the plug blocks the channel indicates that the structure corresponds to a closed pore. A side view (upper right panel) shows that the channel pore is shaped like an hourglass with a central constriction in the membrane. At this point the channel is lined by a pore ring of six hydrophobics residues (represented as magenta spheres in the bottom left panel) that are thought to form a gasket-like seal around a translocating polypeptide, thereby hampering the passage of small molecules across the membrane during translocation. A hydrophobic surface representation of the channel is shown in the bottom right panel and reveals an overall hydrophobic nature, although the cytoplasmic face of the Sec complex is relatively hydrophilic and especially the loops between TMDs 6 and 7 as well as between TMDs 8 and 9, respectively. These loops are important for binding of cytosolic channel partners such as the ribosome or SecA. Profound insight into the first steps of protein translocation was recently provided by the crystal structure of a substrate-engaged Sec complex at 3.7 Å (12). In this structure, a short stretch of a translocating polypeptide was fused to SecA and covalently linked to the SecY channel through disulfide crosslinking. This structure is shown in figure 5 and confirms that SecA (in green) binds to the Sec complex (left panel) via the cytoplasmic loop between TMDs 8 and 9 of SecY (in yellow) as well as its C-terminal tail and the cytoplasmic loop between TMD2 and 3. Moreover, the translocating polypeptide inserts as a loop into the channel. A top view of the channel (right panel, with SecA omitted) shows that insertion of a polypeptide displaces the plug domain to the back of the channel at the periplasmic side away from the lateral gate, thereby opening the pore across the membrane. The signal peptide (designated SP and shown in orange) adopts a helical conformation that is located into a hydrophobic groove outside the lateral gate in front of TMD2 (in red) and TMD7 (in blue), while the polypeptide that follows the signal peptide is inserted into the lateral gate. Opening of the lateral gate induces conformational changes in the region comprising TMDs 2, 3, 7 and 8. Of these, structural rearrangements in TMD3 and 7 create the above-mentioned hydrophobic groove. Collectively, hydrophobic elements of a signal peptide as well as TMDs exit the channel into the membrane through the lateral gate and bind in a hydrophobic groove outside of the lateral gate. This groove probably represents a general binding site for hydrophobic sequences. The C-terminal part of the translocated polypeptide is located into the channel and is surrounded by the residues of the pore ring (right panel). These form a tight seal around the polypeptide in the open channel that prevents the leakage of ions and other small molecules. Accordingly, the structural data discussed above suggest that the Sec translocon is a gated channel that is selectively opened by signal peptides and TMDs. This allows the polypeptide to translocate across the membrane via the central pore of the translocon or insert into the membrane through the lateral gate. The sizable complexes of the eukaryotic Sec system with different translocation partners such as the SRP or ribosome proved difficult to crystalize and consequently detailed structural information on the Sec61 translocon was limited. However, recent advancements in cryo-EM technology enabled the reconstruction of these complexes to near atomic resolution. For example, this technique was used to determine the structure of the native mammalian ribosome-Sec61 complex at 3.4 Å (6). 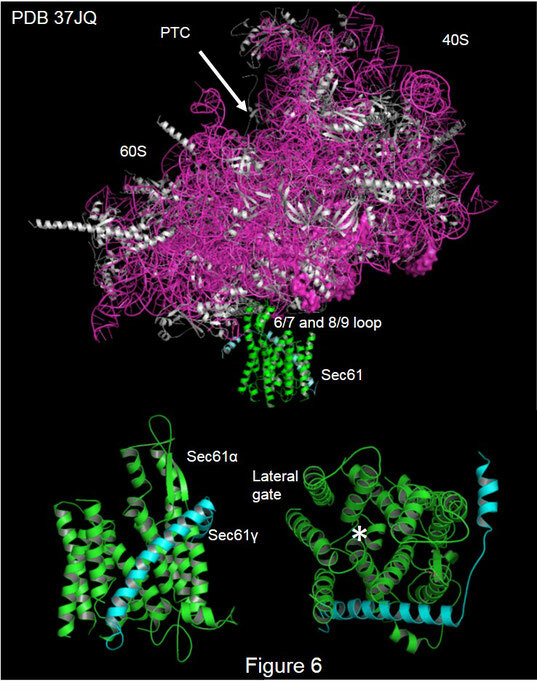 Figure 6 shows a model of the Sec61 system bound to a non-translating 80S ribosome with rRNA in a magenta, ribosomal proteins in grey, Sec61α in green and Sec61γ in aquamarine. The 60 and 40S ribosomal subunits are indicated in the upper panel as well as the peptidyl transferase center (PTC). The model confirms that the ribosome binds to Sec61 mainly through the conserved cytoplasmic loops between TMD6/7 and TMD8/9 of Sec61α as well as the N-terminal helix of the γ subunit. Moreover, the overall architecture of Sec61 is similar to previously reported structures of the prokaryotic SecYEG complex with the α subunit divided into N- and C-terminal halves that are arranged around a central pore (indicated by an asterisk in the bottom right panel that shows a view from the cytoplasm). Both halves of the α subunit are held together at the back by the γ subunit. At the front of the channel an opening or lateral gate is observed between TMD2 and TMD7 of Sec61α (bottom right panel) that provides access to the membrane. In addition to interacting with translocation partners, the Sec61 also dynamically associates with different accessory factors and modifying enzymes, including TRAM, TRAP, signal peptidase and oligosaccharyl transferase (3). A structural alignment of the closed (bacterial) translocon and the mammalian Sec system bound to a non-translating ribosome is shown in figure 7 with SecY in red, SecE in green, Sec61α in grey and Sec61γ in orange. The plug of SecY is in blue, the plug of Sec61α is in yellow and TMD2 of SecY is in magenta. A comparison of both structures shows that ribosome binding is not accompanied by major conformational changes in the translocon. Likewise, the position of the plug domain (left panel) and the helices that surround it are unaltered in both structures, suggesting that the stability of the plug is not affected by ribosome binding. However, subtle structural rearrangements are observed at the opening at the front. In the structure of the ribosome bound complex, TMD2 of Sec61α is specifically tilted backwards relative to the position of TMD2 (in magenta) of the closed channel, thereby opening a small cytosolic region and creating a hydrophobic groove outside the gate that is probably used for the docking of an arriving hydrophobic segment e.g. a signal peptide or a TMD (6). Based on these findings a two-step model was proposed in which initial ribosome binding primes the channel for translocation trough conformational changes in Sec61α that crack the wall of the lateral gate and thereby create an initial site for signal peptide recognition. Subsequently, an arriving signal peptide displaces the plug domain, opening the translocation channel across the membrane (6). The large size of the Sec translocon in complex with different translocation partners proved to be a bottleneck for crystallization, while previously reported cryo-EM structures of the eukaryotic translocon involved in protein translocation or membrane insertion (13) were of insufficient resolution to assess the molecular details of its function. It is, therefore, unclear how polypeptides open the Sec61 channel during translocation or membrane insertion. However, a structural model of the Sec61 system engaged in protein translocation was recently obtained at 3.6 Å by cryo-EM reconstruction of the ribosome-Sec61 complex containing a defined peptide of a signal peptide-bearing secretory protein (5). A structural comparison of Sec61 bound to a non-translating ribosome or a ribosome engaged with a secretory protein is shown in figure 8 with the α subunit in green and the γ subunit in cyan. The left panel shows the structure of the primed Sec61 translocon (bound to an idle ribosome). The plug domain is orange, TMD2 in magenta and TMD7 in grey. A top view (bottom panel) shows that the pore is blocked by the plug and the lateral gate at the front is slightly opened, creating a hydrophobic groove that is used for the binding of arriving signal peptides. The engaged channel is shown in the right panel with TMD2 in red and TMD7 in magenta. Interestingly, the signal peptide of the secretory protein (yellow helix) is located in the lateral gate between TMD2 and 7. A top view (bottom panel) of this structure shows that the translocation channel is open axially across the membrane, while the lateral gate is open laterally towards the membrane. A rotation of TMD2, 5 and 10 displaces several pore residues, which, in turn, destabilizes the plug, thereby opening the translocation pore across the membrane. The opening of the Sec61 complex is, therefore, directly coupled to insertion of the signal peptide into the lateral gate. Based on these structures it was proposed that signal peptides initially associate with a hydrophobic patch near the plug in the interior of the pore around TMD5. If sufficiently hydrophobic, the signal peptide shifts TMD2 to access the membrane and simultaneously displaces pore residues that destabilize the plug, and thereby opening the translocation pore. Integrating the detailed structural information of the Sec complex from a variety of organisms with various translocation intermediates and in different functional states with the wealth of genetic and biochemical data on the translocon, has dramatically increased the molecular understating of Sec-mediated protein export. Thus, the mechanism of protein translocation through the Sec machinery is probably best understood and is summarized in the model shown in figure 9 (adopted from 2). Opening of the channel probably occurs in two steps. First, the translocon is primed for translocation through binding the ribosome or SecA. 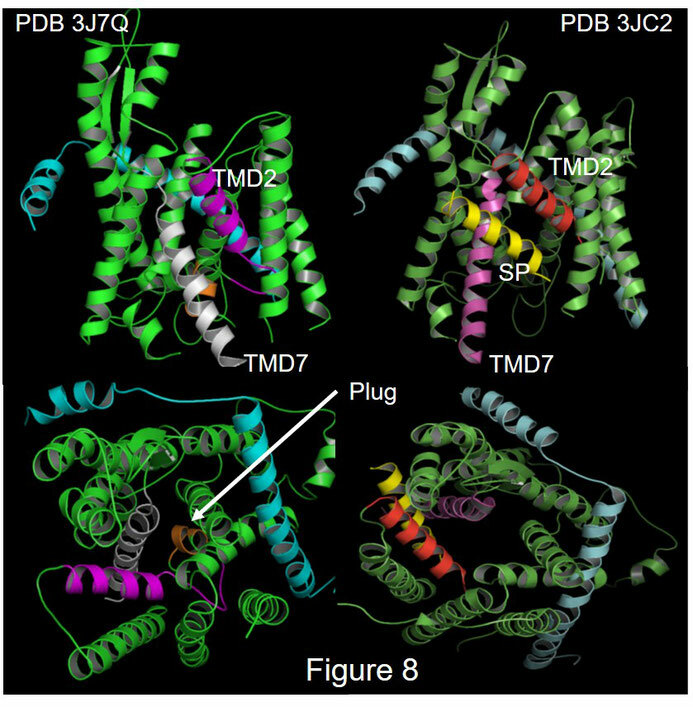 Binding of these translocation partners doe not influence the overall structure of the translocon, although it dislocates TMD2 and 7 at the front. This partially opens the lateral gate and exposes a hydrophobic groove outside the gate that is used for the docking of arriving signal peptides. Next, the channel is activated by insertion of a polypeptide that inserts as a loop with both termini in the cytoplasm. The signal peptide is located at the N-terminus of this hairpin and adopts a helical conformation. It is thought that a signal peptide initially interacts with a hydrophobic patch near the plug in the interior of the pore around TMD5. This view is supported by a recent biochemical study, employing cysteine crosslinking to map the regions of Sec61α that interact with hydrophobic segments in translocating polypeptides (14). In both the post and cotranslational Sec complex, the signal peptide sits in the exposed hydrophobic groove outside the lateral gate. It therefore seems that, if sufficiently hydrophobic, the signal peptide shifts TMD2 to access the membrane and simultaneously displaces pore residues that destabilize the plug, and thereby opening the translocation pore. As translation continues, the signal peptides remains bound outside the gate and is ultimately cleaved off by the signal peptidase complex, while the C-terminal part of the polypeptide is translocated through the channel. Although the mechanism of membrane insertion is less well understood, it is thought that membrane proteins are processed by the Sec machinery similarly as secretory proteins. For example, TMDs dock at the same hydrophobic groove outside the lateral gate as signal peptides. Although signal peptides probably remain bound near the translocon, TMDs are significantly more hydrophobic and can therefore move into the membrane if the connecting loop inside the pore is sufficiently long. The plug is displaced during translation of a cytoplasmic or luminal loop, allowing its translocation. Clearly, more high-resolution structures of the Sec complex engaged in different stages of membrane insertion are required to further the understanding of how membrane proteins are integrated into the lipid bilayer. Secreted and integral membrane proteins account for one-third of a typical biological proteome. In order to reach their target destination, these proteins have to traverse at least one biological membrane which is most often accomplished by a specialized transport complex and a specific receptor (1). The journey of most eukaryotic proteins that function in organelles such as the endoplasmic reticulum, Golgi, lysosomes and cell surface typically starts with cotranslational translocation across the endoplasmic membrane (3) after which the proteins are shipped to their site of action by vesicle mediated transport. The genes and proteins involved in eukaryotic and bacterial protein translocation were initially identified and characterized through pioneering genetic and biochemical experiments, revealing that in these organisms a highly conserved complex made up of three membrane proteins (Sec61α, Sec61β and Sec61γ in mammals and SecY, SecE and SecG in bacteria) facilitates protein translocation across the endoplasmic or cell membrane (2). This knowledge enabled in vitro reconstitution of the export pathways using a cell free translation extract, liposomes and purified components. This established the role of the Sec complex in protein translocation. However, exact mechanistic details of how the translocon facilitates protein export have remained unclear for a long time mainly due to a lack of structural information. The elucidation of the structure of the prokaryotic SecY complex provided the first insight into the molecular details of its function (11). This structure, however, resembled the closed translocon and therefore structures of the channel in different functional states with defined translocation intermediates were highly sought after. These sizable complexes proved difficult to crystalize but advancements in cryo-EM technology enabled reconstruction of these complexes at a high resolution, including mammalian Sec61 bound to a non-translating ribosome and Sec61 bound to a ribosome engaged by secretory protein (5,6). Additionally, the detailed crystal structure of the bacterial SecY channel in complex with SecA and engaged by a secretory substrate was determined recently (12). Together, these novel structures determine the current functional understanding of the Sec translocon (figure 9). Moreover, a growing body of evidence directly links the Sec61 complex with different diseases in humans such as diabetes and cancer and as a consequence the translocon has attracted attention as potential drug target (4). It can, therefore, be expected that increased functional understanding of the translocon will open up novel therapeutic avenues. 2. Rapoport TA, Li L, Park E. 2017. Structural and Mechanistic Insights into Protein Translocation. Annu Rev Cell Dev Biol. 33: 369-390. 3. Voorhees RM, Hegde RS. 2016. Toward a structural understanding of co-translational protein translocation. Curr Opin Cell Biol. 41: 91-99. 4. Lang S, Pfeffer S, Lee PH, Cavalié A, Helms V, Förster F, Zimmermann R. 2017. An Update on Sec61 Channel Functions, Mechanisms, and Related Diseases. Front Physiol. 8: 887. 5. Voorhees RM, Hegde RS. 2016. Structure of the Sec61 channel opened by a signal sequence. Science. 351: 88-91. 6. Voorhees RM, Fernández IS, Scheres SH, Hegde RS. 2014. Structure of the mammalian ribosome-Sec61 complex to 3.4 Å resolution. Cell. 157: 1632-1643. 7. Molecular Cell Biology, 4th edition. New York: W. H. Freeman; 2000. 8. Deshaies RJ, Schekman R. 1987. A yeast mutant defective at an early stage in import of secretory protein precursors into the endoplasmic reticulum. J Cell Biol. 105: 633-645. 9. Bieker KL, Phillips GJ, Silhavy TJ. 1990. The sec and prl genes of Escherichia coli. J Bioenerg Biomembr. 22: 291-310. 11. Van den Berg B, Clemons WM Jr, Collinson I, Modis Y, Hartmann E, Harrison SC, Rapoport TA. 2004. X-ray structure of a protein-conducting channel. Nature. 427: 36-44. 12. Li L, Park E, Ling J, Ingram J, Ploegh H, Rapoport TA. 2016. 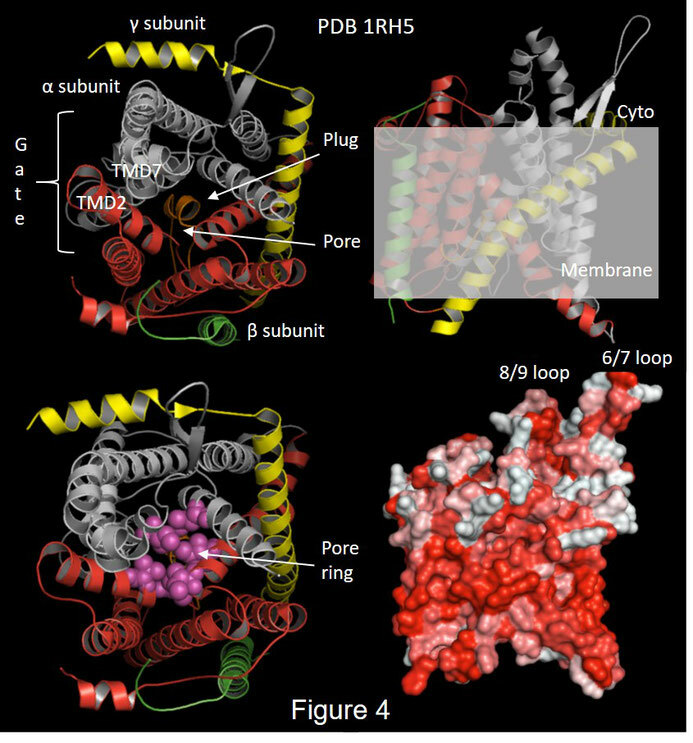 Crystal structure of a substrate-engaged SecY protein-translocation channel. Nature. 531: 395-399. 13. Gogala M, Becker T, Beatrix B, Armache JP, Barrio-Garcia C, Berninghausen O, Beckmann R. 2014. Structures of the Sec61 complex engaged in nascent peptide translocation or membrane insertion. Nature. 506: 107-110. 14. Kida Y, Sakaguchi M. 2018. Interaction mapping of the Sec61 translocon identifies two Sec61α regions interacting with hydrophobic segments in translocating chains. J Biol Chem. 293: 17050-17060.